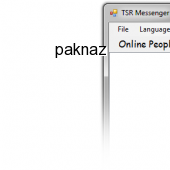 TSR LAN messenger is instant messaging, instant meeting requests, instant support and instant contact with you employers, co-workers or management. With TSR LAN messenger you can do chat meetings, group messages, offline messaging, easy meeting requests, share and work on new ideas, get notifications such as birthdays, meetings, national holidays. Secure LAN messaging, no server is required and no active Internet connection - All message exchanges are protected by the AES encryption algorithm adopted by the U.S. government. Any number of users. Easy installation. Multilanguage.